Victoria International Container Terminal (VICT) has reneged on a pledge made 12 months ago to avoid applying an ‘infrastructure surcharge’ on containers passing through its facility. VICT, a subsidiary of Philippines multinational International Container Terminal Services Inc (ICTSI), has added $48 to the cost of transporting containers in and out of the Port Melbourne terminal following "a review of our terminal charges and market conditions". The move is at odds with VICT operations manager Tony Desira’s ruling it out publically almost exactly 12 months ago. "The Infrastructure Surcharge allows VICT to remain competitive in the market as a viable alternative container terminal," VICT says in its notification to Freight & Trade Alliance (FTA) and the Australian Peak Shippers Association (APSA). In doing so, it appears to support critics’ contention that those who do business beyond terminal gates are paying for stevedores’ competitive battle to attract container shipping lines. "Unfortunately, this comes as no surprise. FTA/APSA predicted this outcome in our meeting with the Chairman of the Australian Competition and Consumer Commission (ACCC) on the 16 February, and we have provided similar warnings to State and Federal Ministers," FTA/APSA says in an advisory to members. "FTA/APSA maintains the position that cost recovery for infrastructure investment should NOT occur via the Vehicle Booking System (VBS), it should be recovered from the commercial clients of the terminal operators, the shipping lines. "Infrastructure charges are a major cost distortion in Australia's international supply chain, where cargo owners are now paying both the shipping line (via Terminal Handling Charges) and the Terminal Operators (via the VBS charges) for the same in-terminal activities. "We understand from our colleagues at the Global Shippers Forum, that these charges are now appearing overseas, using the Australian model." ACCC chairman Rod Sims commented on the issue last year but his organisation is yet to move on it and it is unclear if it can do so. In justifying its move, VICT says that, since starting operations last year, it has "committed to having landside efficiency at the forefront of our innovation, which we have done and continue to do. "This has optimised our Truck Turnaround Times, increased utilisation of trucks and improved safety conditions. VICT remains dedicated to continuous improvement in providing leading landside services. "The Infrastructure Surcharge will be applied to all standard import and export full containers (R&D via road). Road transport operators will be invoiced electronically through existing weekly invoices. "The $10 Chain Of Responsibility charge per container will no longer be an additional charge, and will instead be absorbed into the Infrastructure Surcharge from 27th March 2018." As could be expected, the explanations cut little ice with the CTAA, questioning what has changed on the efficiency front since the terminal was built. CTAA director Neil Chambers says in a statement that "the real reason for the announcement is that VICT needs to prepare itself to offer lower stevedoring rates to foreign Shipping Lines to stay competitive in bid processes against the other stevedores. "And in what is now considered a ‘free-for-all’ in an unregulated market, all they need to do is collect their lost revenue projections from the transport operators (and ultimately importers & exporters) on a ‘take it or leave it basis’." 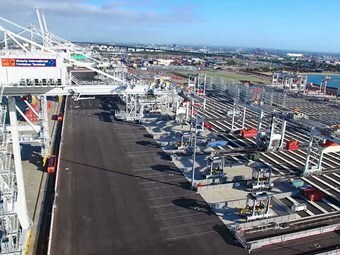 Chambers points out that in 2014, VICT won a competitive bid process to build and operate the new container terminal at Webb Dock and built the facility "in the full knowledge of the costs involved, the landside capacity of the terminal and the technology they have implemented". "To now claim that they need to be rewarded for landside efficiencies and good truck turnaround times is laughable." Chambers adds. "The fact is that while VICT does have consistent truck turnaround times, they still cause inefficiencies in landside logistics operations due to their limited truck entry operating hours." "The larger container transport operators would prefer VICT to open during night shift when a large bulk of container movements to/from container terminals occurs in the Port of Melbourne." "By only operating mostly during daylight hours, transport operators are forced to use additional trucks to meet the import /export task. "That’s more trucks on the road during the day, including peak hours, than there needs to be, at added costs for transport operators." A response from VICT has been sought.